These are the Swamola’s an enemy only found in Zelda: A Link to the Past so far where they are residents in the Swamp of Evil located in the Dark World there. 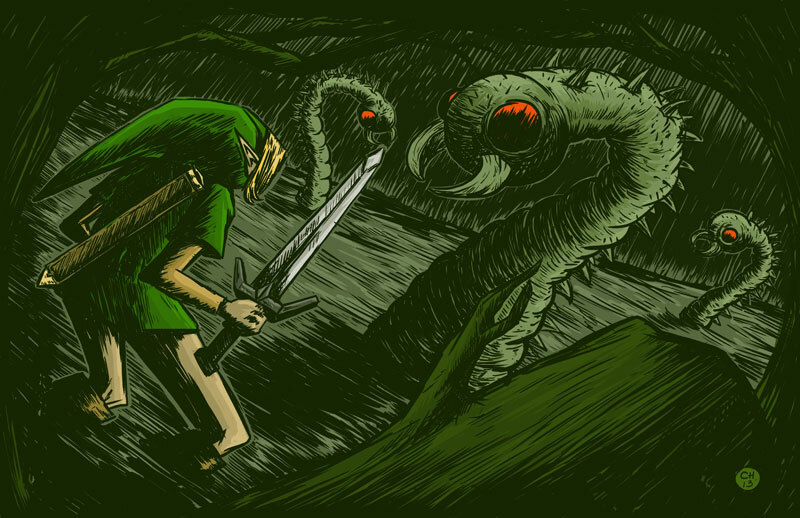 Since we tried to get more monsters and bosses of the first Zelda games drawn for Link’s Blacklist we were very happy about the Swamola illustration by Chris “Xland333” Hegland who claimed these quite unpopular enemies. This is the only detailed drawing of a Swamola on deviantART to date (May 2013) and most likely no other detailed illustrations of the Swamola were ever drawn before beside maybe the official one to the right. Kudos to XLand for this! To beat this one will be a challenge.